Every Tuesday, a new Fermilab Director's Corner appears in Fermilab Today, Fermilab's daily email publication for employees, users and subscribers. This is my last Director�s Corner for the year, so first of all I want to wish you and your family happy and safe holidays! You have contributed to a very successful year, with many exciting scientific results, milestones for the construction of new projects and the very successful conclusion of Tevatron running after another record year. Last week had many important events. 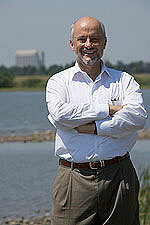 In Washington, we received our �grades� from Bill Brinkman, the Director of the Office of Science. They are, once again, excellent and will qualify us for a further extension of our contract through 2016. We have started the fiscal year with a bang�the wrong sort of bang. In the first two months we have already had four accidents that required days away from work or work restrictions (DART cases). This concerns me a lot. These are our colleagues getting hurt enough that it affects their lives and their work. The statistical errors are large with only four events, however, the average number of DART cases per year for the last four years is only 6.75. 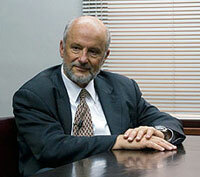 We have demonstrated that we can do even better�in FY2008 we had only three DART cases for the whole year. So let�s live up to our best standards and aim at zero for the rest of this year. We want everyone to come to work and leave work uninjured! Last week�s workshop in Washington DC was remarkable in several ways: a very high attendance, a very high level of energy and an excellent exposition of the broad and exciting scientific program at the Intensity Frontier. With the leadership at the Energy Frontier moving to Europe and the LHC for the next two decades, the workshop demonstrated that programs and projects at the Intensity Frontier also give us the opportunity to answer many of the fundamental scientific questions of our era. The study of neutrinos and rare processes allows us to investigate energies much higher than those accessible at the LHC, albeit in an indirect way. It is very much an open question whether we will be able to develop technologies for new particle colliders that will directly produce energies much higher than at the LHC, or that any such technology will be affordable. In the meantime the Intensity Frontier will be a very active area of exploration no matter what LHC scientists find. Starting tomorrow and running through Friday, Dec. 2, the Fundamental Physics at the Intensity Frontier workshop will take place in Washington D.C., organized by the DOE�s Office of High Energy Physics. Harry Weerts of Argonne and JoAnne Hewett of SLAC are the co-chairs of the workshop, which will explore and document the vast range of opportunities for discovery at the Intensity Frontier. Progress at this frontier will depend on a varied set of facilities, including present and future programs at Fermilab that we aim to use to tackle some of the most important scientific opportunities. More than 500 participants are registered for what should be a very exciting and consequential meeting. This week�s Director�s Corner is just a short greeting wishing you and your family a happy Thanksgiving. It has been a challenging year. Despite the many struggles, we have much to be thankful for, especially the support and commitment of all our colleagues at Fermilab that make our laboratory such a special place. On Nov. 11, I attended the concluding session of the Strategic Laboratory Leadership Program (SSLP) at the Gleacher Center of the University of Chicago. In the session, five independent teams with members from Fermilab, Argonne and Jefferson Laboratory presented the results of this year�s project. In its most succinct form, the goal of this project was to design a presentation for a congressional committee or a group of influential voters unfamiliar with our work that would give a convincing strategic message for the value of basic research in our national laboratories. The groups worked independently, putting to work what they learned in the program and approached the problem in strikingly different ways. It was a fascinating and stimulating afternoon. I will borrow freely from the different approaches that these groups presented. Our Accelerator Advisory Committee is meeting at Fermilab this week. The AAC is appointed by me and is composed of international accelerator experts. Their advice on the evolution of our program is of great value. The committee meets annually with a charge that typically focuses on specific aspects of our program. This year�s meeting, coming on the heels of the Tevatron shutdown, looks more broadly at our program. We will benefit greatly by this view of all of our accelerator activities, their relative balance and how they fit into an overall strategy for the laboratory and the fields of accelerator science and particle physics. I am attending a symposium titled �Subnuclear Physics: Past, Present and Future� organized at the Vatican Pontifical Academy of Sciences. 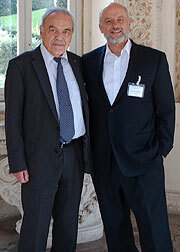 It is the first time that a meeting on particle physics has taken place at the Pontifical Academy. The venue is a villa built in the 1500s inside the Vatican gardens, quite different from our usual particle physics meeting locations. Newspapers in Italy have picked up on the meeting with the usual sensationalistic headlines, such as: �The Vatican calls on physicists to understand the Superworld.� The discussions at the symposium, of course, are more modest and down to earth. Preparing for the meeting has been an opportunity for me to reflect again on the huge contributions that Fermilab has made to our understanding of physics. I presented highlights of this work as well as a very compressed description of our future program � many results to make us all proud of our history and optimistic about the future. In looking over the last few decades, the progress made in our understanding of the world around us has been remarkable. We have gone from the fog of the 1960s to the very sharp questions our field asks today. Last Sunday, I gave a keynote address on large scientific collaborations at a conference organized by the American Association for Cancer Research in San Francisco. The theme of the conference was how to translate genome discovery into effective biomarkers and therapies, from basic scientific research to drug discovery. It was an unusual talk for me to give and for biologists to hear, but one that was a lot of fun to prepare. Because the projects to translate voluminous genomic data into effective therapies have become very large and complex and require the collaboration of many institutions, the organizers thought it would be useful for me to describe how we successfully manage the very large collaborations in particle physics such as CDF, DZero, ATLAS or CMS. It was also important for me to analyze how projects in particle physics differ from large biological projects in order to understand whether the particle physics experience is at all relevant. The International Committee on Future Accelerators (ICFA) organizes a seminar every three years. This year the seminar was at CERN with a focus on outlining future opportunities in our field. The seminar typically brings together some 150 leaders of our community from Europe, the Americas and Asia. The meeting includes both scientists and agency managers, who are usually absent from most other particle physics meetings. In conjunction with the ICFA seminar, I attended a meeting of ICFA (I am the chair elect) and a meeting of the Funding Agencies for Large Colliders (FALC) which has one laboratory director per region in addition to the several representatives from the funding agencies. ICFA also presented the booklet, �Beacons of Discovery,� outlining a global vision for particle physics. Future opportunities at the energy frontier are focused on the LHC -upgrades and what will come after the LHC. Friday was a bittersweet day. We said farewell to the machine that was the lifeblood of our laboratory for decades, celebrated its remarkable achievements and continued looking ahead to the coming results from the final data analysis. We saw how far the Tevatron�s legacy has reached, evidenced by the hundreds of articles noting its final shutdown published in news outlets around the world. Seeing former colleagues and reading comments left on our guestbook reminded us of what may be the Tevatron�s greatest legacy � the thousands of people who were trained on or simply inspired by the Tevatron and its experiments who have gone on to do great things. This week we bid farewell to the Tevatron Collider, an accelerator whose far-reaching legacy spans particle physics, accelerator science and industry. The shut down will take place starting at 2 p.m. on Friday, and I invite all Fermilab staff and users onsite and at their home institutions to watch a live broadcast of the shutdown activities from Ramsey auditorium or online. It�s fitting that, in the same week that we shut down the Tevatron, our laboratory will host an important discussion on the future of underground physics in the United States. Tomorrow the U.S. House of Representatives Science, Space and Technology Committee will hold a roundtable discussion on the DOE deep underground science program. With the close of the fiscal year approaching, it is important for us to understand any significant trends in our safety performance. Looking at the numbers is the only way to discern trends. Whenever we do that, however, we run the risk of taking our attention off of what is really important: our people and the customs that sustain a strong safety culture. The first important statistic is that we are reporting well, from the minor incidents requiring only first aid to the more serious injuries requiring days away from work or work restrictions (DART cases). The reporting of all injuries is an important part of our culture as it is easier to see overall trends and developing problems before more serious safety issues arise. Over the past week, we completed three full days of presentations on what we call the budget uploads for FY12. These detailed budget presentations tell us how all the divisions, sections and centers fit our budget guidelines for the coming fiscal year. The process is an iterative one where, at the end of the day, the planned work has to correspond to the budget and staffing levels in the multiple budget lines we receive. We prepared for these analyses by providing guidelines two months in advance of these presentations with the funding levels we expected for the more than 50 budget and reporting categories we receive. These guidelines are our best guesses, hopefully conservative guesses, of where the funding will end up. Yesterday we celebrated Labor Day and the end of summer. Celebrating labor is easy - we have done a prodigious amount of it in the last few months, and we see nothing but a huge amount ahead of us. It has been a good but arduous summer, with a series of Tevatron problems associated with storms and with a number of difficulties with the NuMI neutrino targets. The Tevatron is back up to snuff with more than 60 inverse picobarns for the last week, and we are running the neutrino beams very effectively with one of the previously used targets. Starting today, and for the next two and a half days, the Contractor Assurance Peer Review will take place at Fermilab. Throughout the history of the laboratory, first URA and then FRA have had many processes in place to make sure that the requirements and expectations of the contract with DOE were met. As laboratory and FRA managers have prepared for this review, we have articulated these processes and integrated them into a Contractor Assurance System (CAS). The goal was to develop a comprehensive and transparent CAS that would assure contract performance. The Lepton Photon Symposium (LP2011) taking place in in Mumbai, India, is the principal international meeting in particle physics this year. It is the 25th Lepton Photon symposium in a series of conferences that alternate yearly with the International High Energy Physics (ICHEP) meetings. It is taking place at the Tata Institute for Fundamental Research (TIFR), one of the principal science institutions in India with a rich scholarly tradition going back to its founder Homi Bhabha, a name familiar to all high-energy physicists. TIFR was founded in 1945 and operates under the umbrella of the Department of Atomic Energy. It is a special time in particle physics with many results from all areas of our field. There are many results from Fermilab, and we�re beginning to see the early data from the LHC. Hints on the Higgs that come from the LHC will be checked quickly, since the doubling time for the LHC data is only a couple of months - if that much. Many new results from the LHC were presented at the European Physical Society meeting three weeks ago. Those same results, with a few important updates, were presented this past week at the 2011 meeting of the American Physical Society�s Division of Particles and Fields (DPF). About 500 registered participants attended DPF 2011, which was organized together with Brown University and took place in Providence, RI. We are approaching the end of the fiscal year. All machines have run well, despite many difficult weather-related issues this summer. The heat and humidity have been extreme, limiting our ability to cool many components. The thunderstorms brought additional problems. A large power failure about a week ago brought the complex down hard. It took a large effort to bring accelerators and detectors back up to full production. The Tevatron has already produced more than 2.2 inverse femtobarns of data this year, and it has a shot at having another record year. The experiments continue to publish important results, and they will dominate the search for a Higgs boson at the lowest mass range for another year. The agreement to raise the debt ceiling has removed a specter that hung not only over the laboratory, but over all our lives. It has been difficult over the last weeks to take our minds off the struggles in the capital over reducing the federal deficit. Many of the old timers in Washington have suggested that these weeks have been the most difficult and polarized ever. We studied many financial �what if� scenarios for the laboratory, including the implications of a government default and the immediate actions we would have to take. It was not pretty and it is a relief that such things will not come to pass. It is a fact, however, that there will be pressures on the budgets for all government-funded work until the deficit is reined in. The Budget Control Act of 2011 that was passed by the House of Representatives yesterday and is expected to pass in the Senate today places a cap on discretionary spending for FY2012 that is $24 billion above the limit already passed by the House of Representatives in its budget resolution. A number of important events occurred last week. 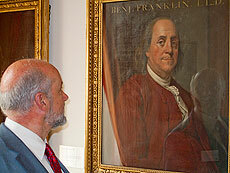 On Monday, the Honorable Chaka Fattah visited the laboratory, accompanied by Bill Brinkman and DOE staff. Rep. Fattah is a senior member of the U.S. House Appropriations Committee. A devoted public servant, Rep. Fattah has represented Pennsylvania in Washington since 1983. His visit gave us an opportunity to tour the laboratory, showing him some of the experiments and facilities. We also had a lively discussion about our plans and needs for the future. We are very appreciative to Rep. Fattah for taking the time to visit the laboratory during this very arduous time in Washington. I realize that the self-select voluntary separation program is on everyone�s mind, but it is too early to say very much. We have received 62 applications for the program, but employees have until Thursday to rescind. The summer continues to be very busy. A great deal of energy and excitement is in the air with the approaching major summer conferences. The first one is the International Europhysics Conference on High Energy Physics http://eps-hep2011.eu/, July 21-27, where we will see for the first time results from the LHC with more than 20 times the luminosity of the previous year. There will also be new results from the Tevatron and many other programs. This conference will be followed in short order by the meeting of the http://www.hep.brown.edu/~DPF2011/Division of Particle and Fields of the American Physical Society in Providence, RI, Aug.9-13, which will include a plenary session on celebrating the Tevatron and include a forum on Project X. At the end of August, the Lepton Photon Conference will take place in Mumbai, India. After last year's decision by the National Science Board to deny further NSF funding for DUSEL, the DOE Office of Science convened a committee led by Jay Marx and Mark Reichanadter to evaluate the Office of Science's options for underground science. The findings of the committee were presented last Thursday to the High Energy Physics Advisory Panel. The charge to the committee was to assess options for the development of the Homestake site and to present costs associated with various options. The site could be used for the Long Base Line Neutrino Experiment (LBNE), direct dark matter searches and neutrino-less double beta-decay experiments. Last week the T2K Collaboration in Japan announced the observation at http://www.interactions.org/cms/?pid=1030824 of electron neutrino appearance events using the neutrino beam from J-PARC to the Super Kamiokande detector (Read paper submitted to Physical Review Letters) at http://jnusrv01.kek.jp/public/t2k/sites/default/files/t2k-nue1st.pdf. The collaboration reported the observation of six events with an expected background of 1.5 � 0.3 events. The probability that the background would fluctuate upward to give six events is less than 1 percent. Thus we now have strong evidence that muon neutrinos oscillate to electron neutrinos and that the last unknown neutrino mixing angle, called theta-13, which tells us about these oscillations is relatively large. That this parameter should be relatively large is important because it will enable a rich future program of neutrino oscillation experiments, in particular experiments that will be able to make statements about matter-antimatter asymmetry in the universe. This measurement is a great achievement for our colleagues at J-PARC and T2K. Last week Fermilab was the subject of an institutional review. Such reviews are infrequent and arduous, as they cover the entire laboratory including facility operations, scientific program, current and planned projects and strategy for the future. 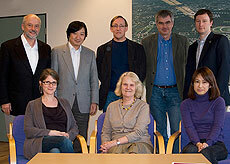 Six managers from DOE and 10 reviewers from other labs and universities worked very hard during the four-day review. We are very appreciative of their recommendations. I think they will prove helpful in the future as we sell our program. 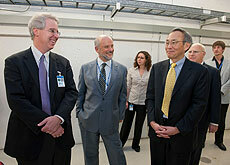 Last week we had the privilege to host Energy Secretary Steven Chu at the laboratory. It was an opportunity for us to explain our program and ambitions, to showcase our facilities and to make the case for supporting the fundamental research that we do. Secretary Chu had not been to Fermilab since his days as a graduate student, when he was performing precision measurements in quantum chromodynamics. Secretary Chu�s understanding of physics is extremely broad, extending from issues in general relativity to biophysical processes at the cellular and molecular levels and precision measurements relevant to particle physics. While director at Berkeley Lab he oversaw a large group of students and postdocs carrying out research. The 44th edition of the Users' Meeting will take place on June 1 and 2, and it should be very exciting. The Users' Meeting is a well-established tradition at Fermilab. Every year it showcases results from the entire Fermilab experimental program, alongside discussions of the lab�s future program and presentations from government officials about policies applicable to particle physics. This year we are very fortunate to have the Secretary of Energy, Dr. Steven Chu, presenting the Meeting�s public lecture at 8 p.m. on June 2. This year has a special edge as we approach the end of data collection at the Tevatron. This remarkable machine is achieving luminosities considered impossible decades ago with antiprotons -- more than 4 x 1032 cm-2sec-1 instantaneous luminosity, with 11 femtobarns of accumulated luminosity recently celebrated. This morning I chaired the opening session of a discussion on the LHC at the Royal Society in London. Sir Isaac Newton sat to my left, looking onto the audience from a painting. Today�s event is one in a long tradition of Royal Society discussions going back about three and a half centuries. The purpose this time was to engage a broader audience on the many facets of the LHC, from its scientific potential for discovery, to the science and engineering of the accelerator, to the technological developments of detectors and computing, and to the social, political and financial aspects of mounting such a global project. The audience included distinguished members of our field, science writers and reporters, scientists from other fields, policy makers and the interested public. This is another important acronym to learn: CAS, which stands for Contractor Assurance System. The basic principle of CAS is that if Fermi Research Alliance, the contractor for Fermilab, establishes a system to assure ourselves that we are meeting the requirements and goals of our contract with the Department of Energy, then the role of oversight by DOE and the demands placed on us by that oversight can change significantly for the better. The skeptic among you might question how adding a new system, in this case the CAS, could actually improve both our performance and the interactions with our sponsors. The skeptics would believe that the only way to improve our effectiveness today would be by subtracting requirements and systems not by adding them. To understand how CAS will in fact help us in the future you have to understand how we and the DOE currently make sure that we meet the terms of our contract and achieve the goals we have agreed upon. The traditional April meeting of the American Physical Society is taking place in Anaheim, CA. It began on April 30 and will conclude on May 3. Several APS divisions participate in this meeting: Particles and Fields, Nuclear Physics, Astrophysics, Physics of Beams, Plasma Physics and Computational Physics. This is the principal annual meeting for our discipline. I gave a talk on the �Tevatron and Beyond� and participated in a panel discussion on policy together with several prominent members of the community, the former DOE Associate Director for High Energy Physics Dennis Kovar and the Associate Director of Science at the White House Office of Science and Technology Policy Carl Wieman. It is a special time for particle physics, with a number of hints that perhaps presage some great new discoveries, but not one of them is yet anything we would call a definitive result. The Tevatron is concluding its career with new records in luminosity and a series of new measurements that show deviations from the physics we would predict from our current knowledge. If some of these hints are confirmed with the data we will collect through the end of this fiscal year, the Tevatron will have yielded more spectacular results in its fantastic career. Lyn Evans, in his talk at the APS on colliders, praised the luminosity achieved by the Tevatron saying that he would have never believed that it would be possible to achieve such luminosity with antiprotons, particles that have to be made, captured, stored, cooled and collided in a very complex process. The Continuing Resolution enacted last week for the remainder of this fiscal year contains cuts that amount to approximately $38 billion compared to the FY10 budget, the current level of government spending. The cuts to the DOE Office of Science represent about 1 percent of its FY10 budget but are larger when compared to the proposed President�s budget for FY11. Nevertheless, these cuts are much smaller than the cuts proposed several months ago in the House. The relatively small cuts to the DOE Office of Science in the final bill reflect the role that the DOE Office of Science plays in the future of our country. At this time I cannot tell you exactly what the situation will be at Fermilab for the rest of the year since we have not received the final bottom line for the year from the DOE Office of Science. We should receive the number in the next few days. I would expect that we will be able to run the Tevatron as planned and that we will have an orderly transition after the Tevatron is shut down at the end of September. In the midst of all the hurly-burly of the last few weeks, from the budget negotiations in Washington, to the fire in Soudan, to finding evidence for what could turn out to be a revolutionary discovery, other important events have gotten less attention. Last Saturday we brought the NuMI beam to full operation, several weeks ahead of the originally conceived schedule. The graphite target that we use to produce neutrinos failed late in February during operations. A very careful autopsy - difficult to carry out - confirmed our suspicions regarding the cause of the failure. These targets are very delicate objects and are manufactured in Russia�s atomic energy industry, which has the ability to braze the target cooling tubes to the graphite slices that are at the core of the target. The first NuMI targets had long lifetimes, but more recent targets have developed leaks after short periods of operation. We suspected a specific set of welds had failed and this was confirmed by the autopsy. We observed that the replacement target had the same issues on this section of welds and redesigned the troublesome section. This modified target is now in the beam and we hope will achieve the long-term performance of the early targets. Last Wednesday I was able to see how technicians installed the new target in the NuMI beam line. This installation and the whole operation of understanding and modifying the target have been very impressive indeed. Kudos to Kris Anderson and all involved! There is no news yet on the budget for FY11, although we hope for some resolution within the next few days, as the current Continuing Resolution expires this Friday. There are, however, several important issues to note while we wait. Yesterday, House Appropriations Committee Chairman Rogers (R-KY) introduced another Continuing Resolution to extend funding through April 15, with another $12 billion in spending reductions attached to it. If passed, those reductions would not affect Fermilab. As we watch and worry about the political debate in Washington and struggle to maintain our laboratory at the forefront of particle physics, it is also important to look at the positive side of our lives. Counting one�s blessings is a very good way to maintain perspective. A special blessing for me has been the arrival of our first grandchild on March 2: Gemma Lucia Oddone. I was fortunate to meet her a week later and be reminded once more how amazing babies are: so totally captivating, so totally dependent and at the same time, as a colleague reminded me, �tough little buggers.� During the few days I saw her I could see the day-to-day changes as the circuits in her brain self-assembled and she connected to her surroundings. The last few days have been quite challenging. Not only are we dealing with the specter of significant budget cuts, but last Thursday a fire in the access shaft at Soudan stopped all operations there, and here at the lab Sunday�s violent lightning storm brought a lot of equipment down, causing the Tevatron to quench and damaging one of its dipoles. With these problems for the MINOS and CDMS detectors at Soudan, and the Tevatron here, our resiliency is being put to the test. Fortunately the fire in the access shaft at Soudan has been controlled; emergency personnel have been down to the bottom level of the mine and re-established communications. No one was in the mine at the time of the fire. The hoist is operating, and we expect access to the laboratory in the next couple of days. At this point we do not expect damage to MINOS and we hope for either no damage or minimal damage to CDMS due to the uncontrolled warm-up of the cryogenics system. It is impossible to write a column this week on anything other than the grave tragedy that has occurred in Japan. Our hearts and prayers go to all our friends and colleagues in Japan in these difficult hours. Our high-energy physics community is tightly knit. Over the years we�ve made many friends in the Japanese physics community as we have worked together on very challenging projects. Last year we celebrated a remarkable 30 years of collaboration across a broad front of activities under the US-Japan Agreement on High Energy Physics. As part of the DOE budget process, last week we presented the program of the laboratory to the Office of High Energy Physics (OHEP) under three budget scenarios for the fiscal years 2011 through 2015. The guidance for these scenarios came from OHEP. The lowest scenario was one in which the program was cut by 5 percent in FY2012 relative to the FY2010 enacted level and stayed flat, without inflation adjustments, through FY2015. The middle scenario was one where we essentially stayed flat from FY2010 through FY2015, without inflation adjustments. In the top scenario we were encouraged to ask for what we need to accomplish an optimal program by adding selectively to a limited set of initiatives. At the end of the day we will live in only one scenario, possibly not even one that we presented. However, each of the three scenarios is important. Together they describe where we would make cuts if we had to cut and where we would add funding should this become possible. These scenarios allow our program managers to propose and defend budgets for HEP in the context of the overall Office of Science. As I head to Washington to present our budget to DOE for the 2013 fiscal year, I want to let you know that Fermilab would not immediately be affected by a government shutdown, and to set the record straight regarding impacts on staff of proposed budget cuts. As you know, the federal government is currently operating under a Continuing Resolution that expires this Friday, March 4. If Congress does not either pass a budget for this fiscal year or extend the Continuing Resolution by Friday, the government will be forced to shut down, which would have wide-ranging effects on the nation�s economy and citizens. Last night the House of Representatives approved a two-week budget measure that would extend through March 18, and the Senate is expected to vote on the legislation today. If the government were to shut down, however, it would not immediately affect the operation of our laboratory. Fermilab has sufficient monetary reserves in our contract from DOE to continue operating for several weeks, even if no new funds are made available. Employees of FRA, as government contractors, would be able to continue working during a shutdown as long as funds permit. 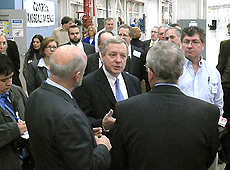 During the last week we have had two important visits by our legislators. Last week the Honorable Randy Hultgren visited the laboratory and spent an hour with senior managers hearing about our contributions to science and our plans for the future. We appreciated his visit very much in this season of great uncertainty. Representative Hultgren explained his support and enthusiasm for the work we do here at Fermilab. He also explained the difficult fiscal situation for the nation and the fact that cuts will have to be made in many programs. He was eloquent in expressing his commitment to our long term success and he plans to visit again later this month. 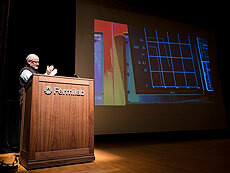 He has expressed this support for Fermilab in other venues as well. 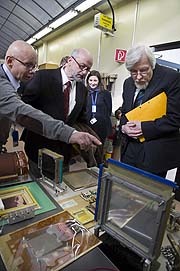 When I visited CERN two weeks ago Rolf Heuer and I had the opportunity to get a guided tour of the particle detector school EDIT, �Excellence in Detectors and Instrumentation Technologies�. This was quite a remarkable event and is described in yesterday�s issue of Fermilab Today. We are planning to host the school here in the US next. It will be a great deal of work, but also greatly rewarding. Calorimetry: from the basic concepts to the energy flow. We live with a great deal of tension waiting for the resolution of various budgets. February is the month when everything piles up: actions by Congress on the budget for the current fiscal year, FY11; the FY12 budget that the President proposed yesterday to Congress; and preparations for the FY13 budget that DOE has started developing. We�ll start with the FY13 budget. We have received guidance from DOE on the scenarios that we should use to propose budgets for the laboratory. The guidance has three scenarios. The middle scenario is essentially flat funding with respect to FY11, in effect the FY10 level since we are in a Continuing Resolution and do not yet know our final budget for FY11. Then there is a lower scenario representing a 5 percent cut from FY10, which is already a very tight situation. Finally there is the scenario that we all dream about but never get, namely one where we propose the budget that we need to carry out our program at full capacity. We will be presenting these three budgets to the Office of High Energy Physics on March 3. Organization charts convey a lot of information about the structure of institutions and how they function. The charts evolve as institutions advance and circumstances change. Our last major revision of how we display our organization was for the contract competition in 2006. When we look at that organization chart five years later we realize that several areas need tidying up. At the top level today there are four major sectors in our laboratory: particle physics, accelerators, computing and operations. Cutting across those four sectors are various sections and support offices: the Finance Section, the ES&H Section, the Office of Communication, the new Office of Program and Project Support that I described last week and the Directorate. The referenced document depicts and explains all this. In addition, at the top level of the organization, we show projects that cut across all sectors of the laboratory that either are very large or will become very large (greater than $750 million) as we evolve into the future. These projects require external visibility and attention by the director and hence are highlighted at the top level of the organization. FALC has been a useful informal avenue for communication among the principal funding agencies that support particle physics in the world. Starting last year, the Director of KEK, Atsuto Suzuki, and I were added to this group in order to have one laboratory director from each of the three major regions, the Americas, Europe and Asia. Up to that point, FALC was limited only to participants from funding agencies, except in the case of the CERN director general who had been included in the original FALC not as a CERN representative but as representing the �small European countries.� I attended my second meeting of this group last week at SLAC. President Dwight D. Eisenhower�s quote that �Plans are nothing; planning is everything� is right on target for particle physics. Our circumstances change quickly in response to new physics observations, budget changes in the middle of the fiscal year or unexpected agency decisions such as the recent failure to secure interim funding for DUSEL. Reacting quickly and adjusting our plans to re-optimize our program is a necessity. We want to elevate our game in this regard, and to do so we need to be more systematic. Yesterday we received the news that we will not receive funding for the proposed Tevatron extension and consequently the Tevatron will close at the end of FY2011 as was previously planned. The present budgetary climate did not permit the DOE to secure the additional funds needed to run the Tevatron for three more years as recommended by the High Energy Physics Advisory Panel. Both Tevatron collaborations did a splendid job articulating the physics case and all the relevant issues to both our Physics Advisory Committee and the national advisory committees, which led to the recommendation to extend the Tevatron. We plan to extract every bit of physics we can from this final Tevatron running period. The Tevatron has already exceeded all expectations, and given the large datasets we will continue to find new results and discoveries in the Tevatron data for years to come. The life of this legendary machine has been marked by historic discoveries made possible by its innovative accelerator and detector technologies. The experience gained during its operation has also immensely helped the development of the LHC accelerator and detectors. Fermilab is and will remain a very strong part of the LHC program and will continue to pursue physics at the high-energy frontier together with our collaborators at CERN. We have closed a great year for the laboratory. Thanks to the efforts of everyone at the laboratory, every program has advanced as planned or faster than planned. Last year's budget miraculously was settled early in the fiscal year. The Tevatron and neutrino programs were the most productive in the world; our particle astrophysics programs made the news and had excellent review by DOE. The LHC turn on was very successful. Mu2e and LBNE both got CD-0, MicroBooNE got CD-1, and the g-2 proposed experiment got top marks and will be done, budgets permitting, setting the pace for our future intensity frontier program. Project X advanced nicely and is likely to achieve CD-0 soon. Two of our theorists were recognized with the Sakurai Prize of the American Physical Society. The American Recovery and Reinvestment Act program stayed on schedule and greatly advanced NOvA, LBNE, superconducting radio frequency and several infrastructure programs. All this was recognized in the grades that DOE gave us in December, which were very good and qualified us for a further extension of the DOE contract with Fermi Research Alliance. At this point we are qualified for four years extension beyond the initial contract, taking us to 2016.